In the past twelve months, the Fidelity Group team has worked hard on the launch of Fidelity eLearning, our e-learning platform, with over 500 courses in more than 50 subject areas, that can be white labelled for channel partners. We have had a new addition to our award-winning marketing team, helping us to develop our social media presence, design innovative campaigns and collateral for our partners, and assisting with our company events. Fidelity Group has an exemplary apprenticeship programme, currently focussed within the IT department, and we are excited for this wonderful team to get the recognition they deserve. The company as a whole work together to make our apprentices feel included and to develop their skills in a variety of areas, moulding valuable individuals seeking placement in the workforce. Our last two apprentices both joined our team on completion of the Microsoft programme, so it has been a clear success and a programme we intend to continue investing in! Our current apprentice is already a shining star, collaborating with our marketing team in his first few weeks to redesign parts of our website (launching soon)! Now in its seventh year, the CDSM Awards give ICT Channel businesses a unique opportunity to acknowledge the skill, determination and success of their sales and marketing teams. With a record number of entries this year, we are excited to have the opportunity to recognise and celebrate our hardworking team at Fidelity Group. Thank you to the whole Fidelity Group team for your hard work, commitment to excellence and ongoing success. 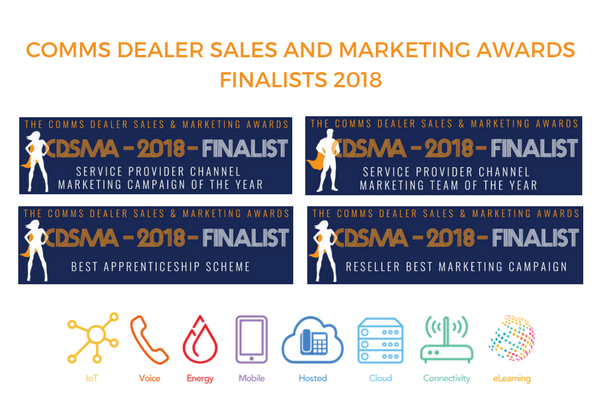 We congratulate all the finalists for the 2018 Comms Dealer Sales and Marketing Awards, and look forward to seeing you at the Park Lane Hotel on May 3rd!